Cook rice according to directions on package. Let cool. While rice is cooking and cooling you can be cutting veggies. Lay in fridge till rice is cool enough. Lay seaweed paper on bamboo mat and cover 7/8th of paper with rice. Place shellfish on opposite end of the uncovered seaweed paper. Place veggies neatly by shellfish (it's supposed to look pretty when cut). Roll seaweed paper starting with the side with all the veggies and fish. Try to roll tightly. Cut pieces about 1 1/2 - 2 1/2 inches thick. Makes about 4-5 rolls. 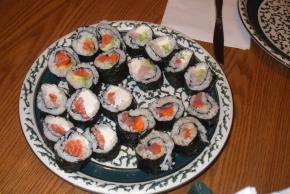 Serve with pickle ginger, soy sauce, and wasabi to the side.